IRT Times Square-Grand Central Shuttle station with museum train, on the 100th Anniversary of the opening of the IRT Subway. Photo by: Richard Panse, October 27, 2004. 42nd Street-Times Square is part of a massive station complex, four stations, on the IRT Times Square-Grand Central Shuttle, IRT West Side Line, BMT Broadway Line, and IRT Flushing Line, all joined together by a vast mezzanine and underground warren of connecting passageways; and a fifth station a long way west by underground passageway, on the IND 8th Avenue/Fulton Street/Rockaway Line at 42nd Street-Port Authority Bus Terminal. 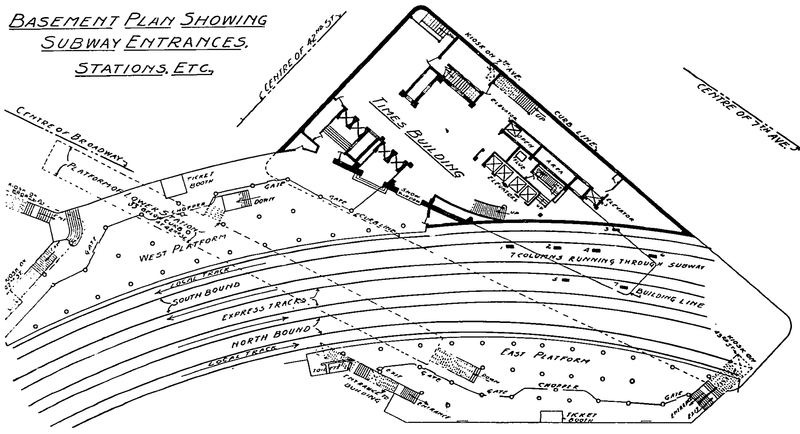 While the stations were all built at different times (1904, 1917-1918, and 1927), it makes sense to describe them as a single complex, given the number of interconnected passageways and mezzanines. Express station with four tracks and two island platforms. There are stairways leading up to various mezzanine levels, and also down, to connecting passageways to the Flushing and IND 8th Avenue/Fulton Street/Rockaway Line. lines. Evidence of former stairways leading down exist at various spots along the platform. The main exit is at the north end, leading directly to the Shuttle and BMT stations. Express station with four tracks and two island platforms. Formerly, stairways and a ramp at the north end led to a mid-level mezzanine, but the renovation efforts have removed the ramps (which, while convenient, were too steep to be ADA-compliant) and replaced them with stairways and new elevators to the mezzanine. This mid-level mezzanine above the tracks features a large oval balcony looking over the trackway and helps to reduce the sense of claustrophobia described by many riders. The platform has unusually high ceilings and old name signs on the supporting I-beams along the platform edges. A "42" monogram mosaic exists along the trackside walls. The express tracks north of the station weave out to pass around a crossunder in the Times Square shuttle station. This crossunder was sealed off in the 1960s due to crime potential. Two tracks, one island platform. As part of the larger Times Square complex, this station was actually built last, and runs approximately under 41st Street, but is the deepest of the platforms. There are various stairways and escalators leading to the different mezzanine and intermediate levels, too complex to fully describe here. The mosaic band has "TS" highlights, and there is an old name tablet reading "Times Square" at the east end near the tower. Some old black on white signs indicating the station name hang along the platform but due to the ongoing renovations, these are an endangered species. Important New Subway Station Opened in New York. The New York Transit Commission, the Queensborough Chamber of Commerce and several civic organizations arranged an elaborate program to celebrate the opening of the Seventh Avenue (Times Square) station of the Queensborough subway on March 14. The new station, in conjunction with the Interborough Seventh Avenue line and the Times Square-Grand Central station shuttle line of the Interborough, consists of four levels. It is one of the most commodious subway stations in the world and will relieve the present congestion at Grand Central, where the former terminus of the Queensborough line is located. There is a Queensborough station at Fifth Avenue and 42d Street, but because of traffic conditions most of the passengers who use the Queensborough line board and leave trains at Grand Central. A considerable portion of this traffic transfers from the Seventh Avenue line of the Interborough and reaches Grand Central by shuttle. All of this traffic will be handled in the new four-level station at Seventh Avenue and 41st Street. The entire extension of the Queensborough subway from Grand Central Station westward under 42d Street, to the rear of the Public Library, thence under 41st Street and west to Eighth Avenue, with the Seventh Avenue connection with the west side subway of the I.R.T., was constructed by the Powers-Kennedy Contracting Corporation. The contract price for the entire extension was $3,867,138. Of this, approximately $1,500,000 has been expended for the section from Fifth Avenue to Eighth Avenue, including the cost of the station and its equipment. Immediately after the exercises the Interborough put in effect a regular schedule, approved by the Transit Commission. -- Electric Railway Journal, April 16, 1927, page 714. New York in Transit, Jacob Lawrence (2001). Located above the midlevel mezzanine between the Shuttle area and the BMT Broadway Line. The Return of Spring-The Onset of Winter, Jack Beal (1999). In the IRT West Side Line mezzanine. Times Square Mural, Roy Lichtenstein. In the space between the three lines, closest to the IRT Shuttle. Easiest seen when entering from the new headhouse in Times Square. Times Square Times: 35 Times, Toby Buonagurio (2005). Mostly located around the Shuttle and BMT line mezzanines. The Revelers, Jane Dickson (2007). Mostly located in the transfer corridors between the BMT and IRT Flushing Line.